I finally did it.. I recorded another video tutorial!! I bought a lovely new yellow polish the other day.. Like I said, Rebecca is basically my muse.. Actually, maybe her blog is a dangerous place for me as I really like every polish she uses.. Anyways.. I was really excited to use this yellow.. But how?! 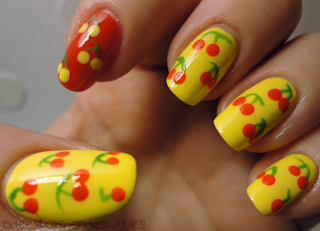 Ohh wait, I have been loving things with Cherry prints lately.. Why not do that to my nails? 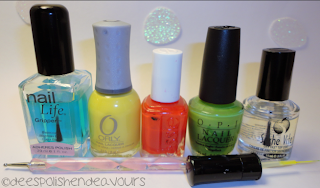 I used: Orly Spark, Essie Lolipop & OPI Green-Wich Village. I also used one of my trusty dotting tools (provided to me by Born Pretty) and my wonderful little brush. 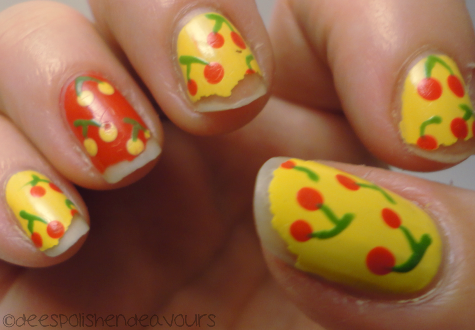 Want to see how I did these? Visit this LINK. I am changing my youtube channel to my own personal account. It was just too much work going back and forth with sign-ins. This should be way easier!! Oh, and a photo of my right hand.. After ONE FREAKIN' DAY! This is what I got for not using Seche Vite.. My left hand was still in pristine condition.. The dish pit at work also took chunks out of my nails.. Good thing this isn't my "photo" hand. Stupid steel wool.. If only I would wear gloves..
Have a great night/day/evening/whatever time of day you venture over here at - have a good one!! Tierney - Yay! I'm glad!! Miki - Zebra is one of my first loves.. I often forget about it though. Glad you like the colours as well - such a good combo!! MaryBeth - They are always a crowd pleaser!! Minty - Haha, ugh, if only I had really been drinking.. I said that only because I felt my lines were a bit of a mess like I HAD been drinking.. Whoops!! Swaafie - Haha, I think if I had actually been drinking, my hands would have been painted and my nails would have been left bare.. This might be a worthwhile project..
Halifax @ Sparkled Beauty - Haha - nope, I am a definite Canadian blogger. I am one of those weirdo prairie kids! You so should - I am kind of in serious like with it (it isn't love.. yet). hehehe, i'm happy to be your muse. Love the reverse thats fun! How gorgeous!! I'm going to have to invest in some yellow and try that out! I love it! BTW, these are super cute nails, it's too bad the steel wool ate it! That is a really cute nail design idea!I love that you reversed it with your index finger and not the ring one :)!